6am, an early wake-up call. Time to get up, GoPro ready, camera charged. 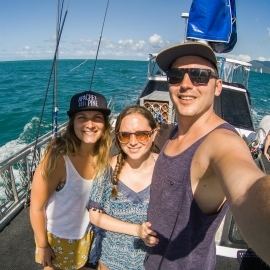 We’re sailing the Great Barrier Reef! It had been more than a year since my last adventure on the reef. Excited was an understatement for how I felt that morning. 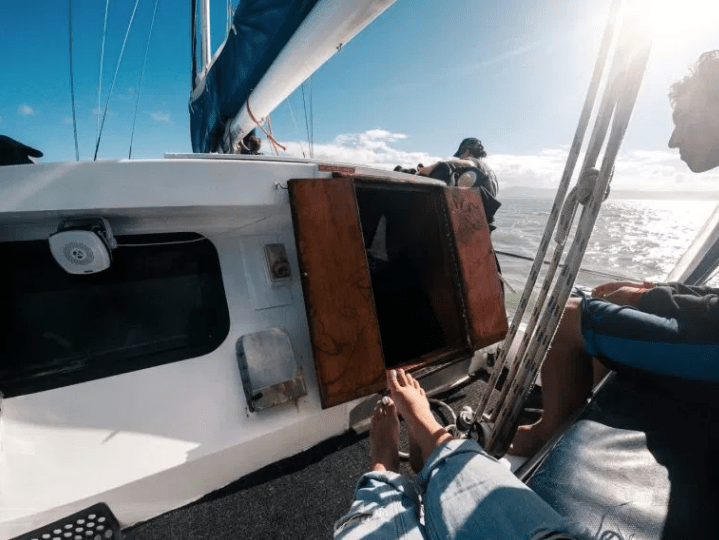 Sailing has been on my list for some time now (ever since I discovered Elayna and Riley’s adventures) and the Great Barrier Reef seemed like the perfect place! Most ships out here are big catamarans, but there are a few original boats that will take you out in an alternative way. Coral Sea Dreaming is one of those boats as she is a true sailing ship. A sailing ship, as I discovered, is very different from a larger boat. You feel like you’re actually on a boat, versus being moved from location A to B. However, I do recommend seasickness tablets! Not long after we left the marina, the first sails were hoisted and we were actually sailing the Great Barrier Reef! First up on our diving adventure was Upolo Cay. It is a sand cay that enjoys the protection of the outer reef. A beautiful little island surrounded by ocean and gorgeous corals. In reality, this is actually an island that consists fully out of fish poo. Yes, you read that right! Pretty small island in the middle of the ocean? That’s a whole lot of Parrot Fish that eat hard corals and poo it back out! I just love those kinds of facts. To be able to go onto the island, one would need a special permit, so we enjoyed it from a distance. Sand cays are perfect for snorkelers and they tend to be quite shallow reefs. Apart from the usual pretty reef fish, we ended up spotting two stingrays and several of the reef’s famous giant clams. As Coral Sea Dreaming has access to 12 different moorings at nine different reefs, it was a surprise to see where we would end up next. 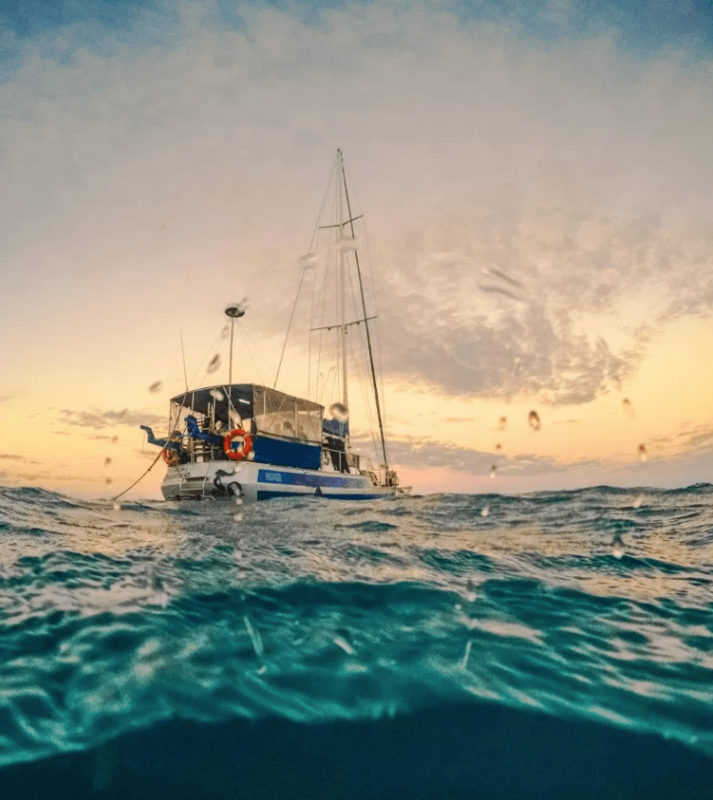 Being quite a choppy day, our captain and owner of the boat, Jan, decided to stay sheltered for the up and coming night and chose Michaelmas Cay as the location for our next four dives. Staying a night on the Great Barrier Reef is one of those dreams where you keep pinching yourself until you actually believe it. While mooring in Michaelmas Cay, I got back into the water to shoot some sunset shots. The water was still very warm although coming out and awaiting our night dive was a bit of a mission. Not being able to have a hot shower in between, I was so happy when Jan poured some hot kettle water down my wet suit. I’ll never forget Jan! The crew comes out to the reef every other night and chooses a spot to moor where it’s nice and quiet. That doesn’t mean you would stay at Michaelmas, but we did. The night was calm in our small bunk, although another seasickness pill was popped just in case. And with the sunrise happening like it did, I could not be happier. Just like Upolo Cay, Michaelmas Cay is a sandy island in the middle of the ocean. Out of the two, Michaelmas is definitely my favorite as the island is surrounded by so much wildlife. 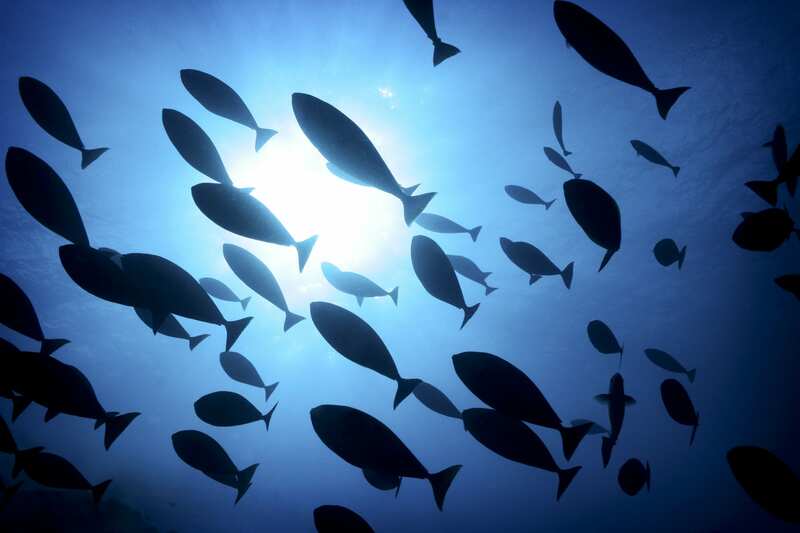 Next to all the underwater life, it is a haven for many seabirds. Being one of the most important nesting areas for birds in and around the Great Barrier Reef, this is quite a special spot. Underwater there is plenty happening. Upon arrival, it didn’t take very long to spot our first turtle! Quickly getting our dive suits on, I couldn’t wait to swim along this magnificent animal. It was the biggest turtle I have ever seen and we spent quite a bit of time with it. 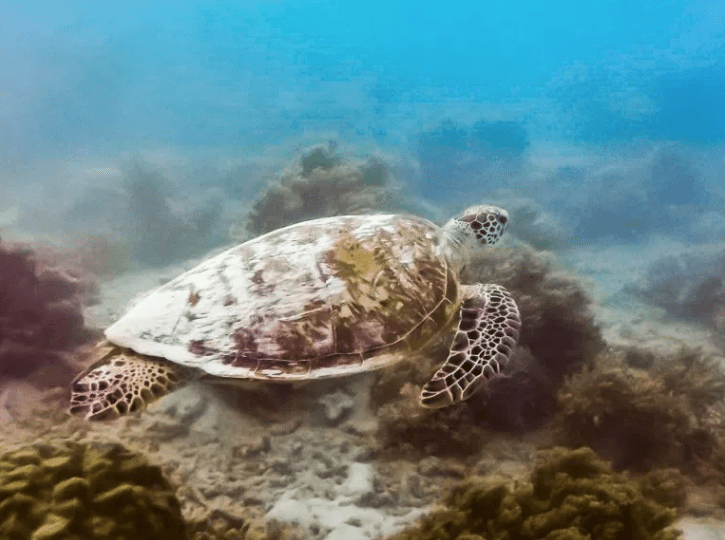 Big sea turtles are one of my favorite sea animals so I was pretty excited to meet this fella and a couple of its friends! 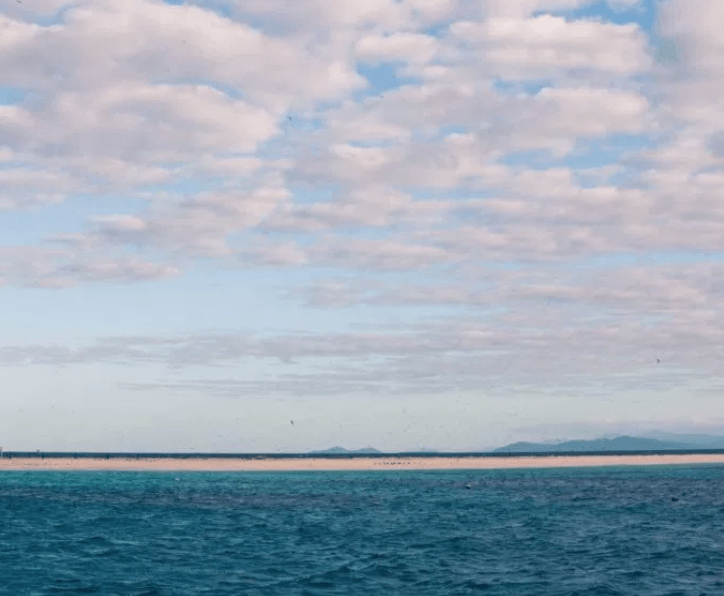 Turning the boat around to the other side of Michaelmas Cay, we visited two more dive and snorkel sites: Long Bombie and Coral Sea Dreaming‘s private mooring point, Dreamtime. When it came to fish, this places were so good. A giant Puffer Fish, Unicorn Triggerfish, several Nudie Branches, Razor Fish and more turtles, you name it! Coral Sea Dreaming is a 16-meter long sailing boat that is still in the original state. 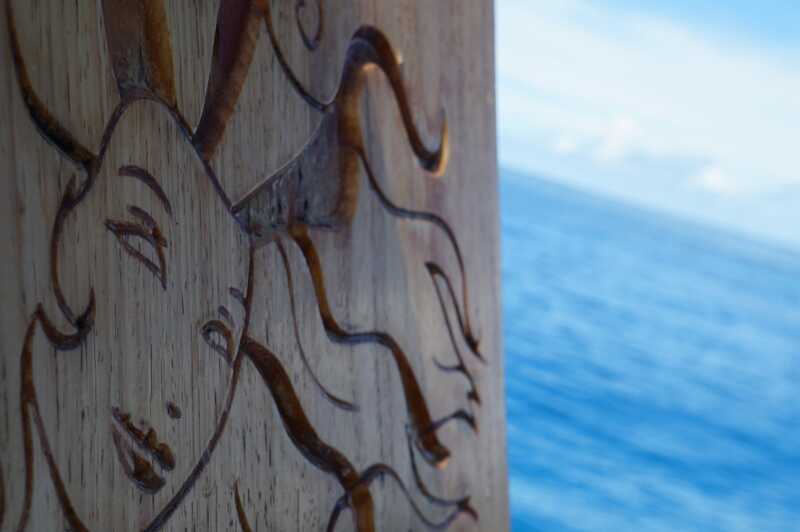 Meaning that you’ll find beautiful wood carvings and furniture all over the vessel. It also means that the number of passengers will alway be small. With only 12 people on board plus three crew, it’s a unique experience. 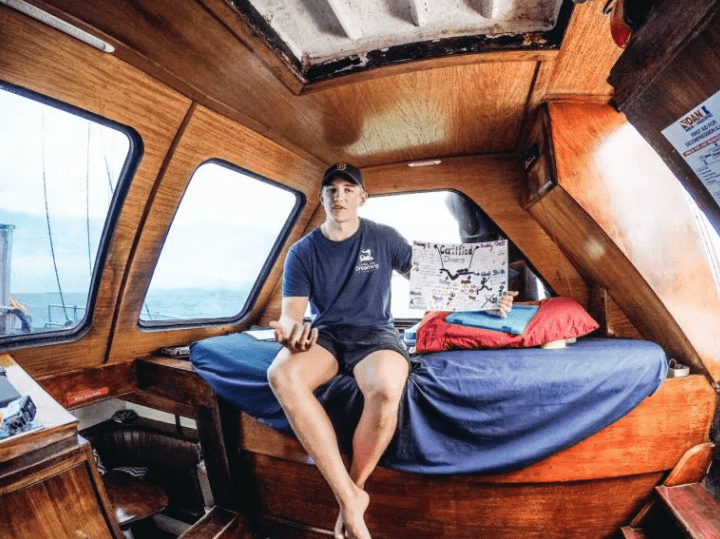 While you might not even talk to most passengers on other reef trips, thanks to the coziness of the boat, we became friends with everyone on board in record time. Therefore the boat is perfect both families (as you can cozy up in a room together) and solo travelers like me. The boat has several toilets and a hot shower. Something that is particularly welcome at the end of a long day in the water. On a boat like this, the crew really makes the trip that bit extra special. With three crew for 12 passengers, you’re pretty well looked after. As the crew consists of all scuba diving instructors, these guys are multi functional as a must! Spending time together, both in and out of the water, you start feeling like it’s more a friend’s trip out more than an organized tour on the reef. However, as you’re getting out of the water and grabbing a coffee, these guys are already making your lunch or dinner. Definitely a much-appreciated effort! Jan, the owner of the vessel and your captain, is a funny and caring person. Expect many jokes and lots of encouragements to explore the water. If you are not feeling up to it, they will accompany you in the water and they’ll guide you all the way down if it’s your first dive experience. 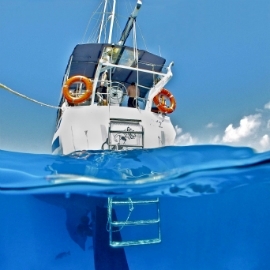 Coral Sea Dreaming is one of the few small family owned companies left that go out to the reef. When I say ‘small family company’, that is really what they are. 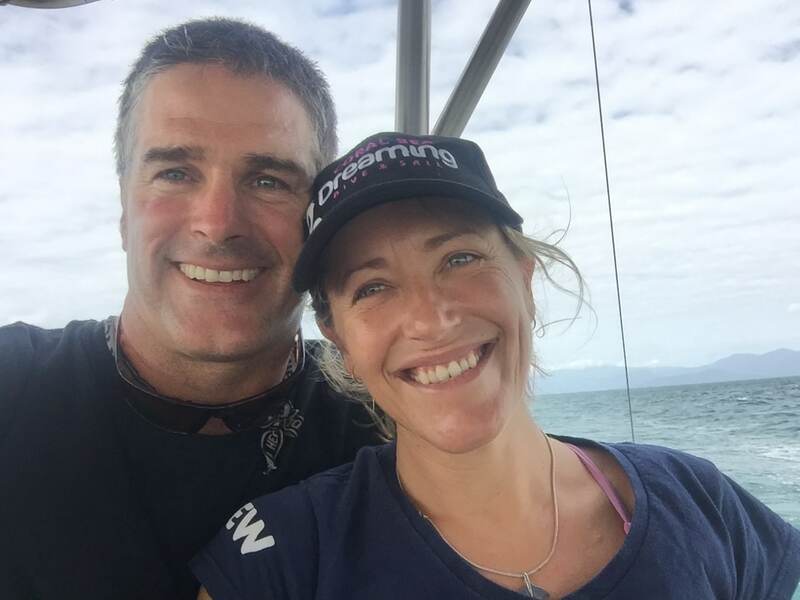 Jan, his wife Claire and their little baby keep this ship afloat and take people out to experience the Great Barrier Reef. They truly care about the reef and about their lovely boat and you can notice that as soon as you step on board. Coral Sea Dreaming succeeds in delivering this niche with fantastic 2-day, small group excursions. David Girsh travelled with us recently and sent us these amazing images and video – check them out.